The Unwritable: Do you Boinc? BOINC is a platform for distributed processing. For example, it takes a lot of processing time to sift through radio signals from the whole sky looking for possible alien signals, like it takes a lot of processing time to test various iterations of mathematical models to see what fits physics data the best. You can volunteer your PC to work for these projects when it is idle, and your PC is idle really, most of the time. Here's a picture of BOINC using it hard. You can see most of the processors are close to max (it often does max them all) and RAM usage dip suddenly as I logged on to actually use the machine. You can see the actual project tasks that are running, ready to run, finished and waiting for RAM allocation. This is all very cool, but it also keeps my office toasty warm in the winter. 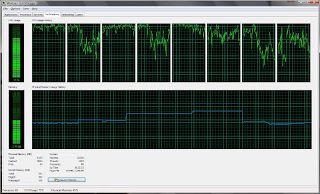 I BOINC using GridRepublic. They are a nonprofit working in collaboration with BOINC to make it simple and easy to discover, join, and manage multiple projects and computers. It is simple as checking your email and only requires one login.